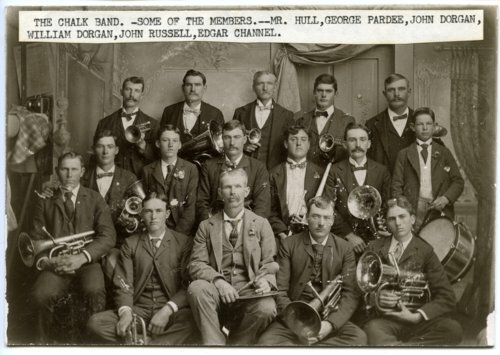 Studio portrait showing members of the Chalk band from Chalk, Kansas. Some of the members have been identified as Mr. Hull, George Pardee, John Dorgan, William Dorgan, John Russell, and Edgar Channel. The man seated on the far left, holding a horn, is Edward Cooper. The man holding the horn and seated to the left of the man in the center is Elzie Cooper, Edward's half-brother.